Are You a J. Crew Democrat or a Pizza Hut Republican? If you live near a Ben & Jerry’s or a few Dunkin’ Donuts outposts, odds are good that your Congressional district elected a Democrat on Tuesday. More familiar with the inside of a Pizza Hut or a Long John Silver’s? Chances are you’ll be represented next year by a Republican. 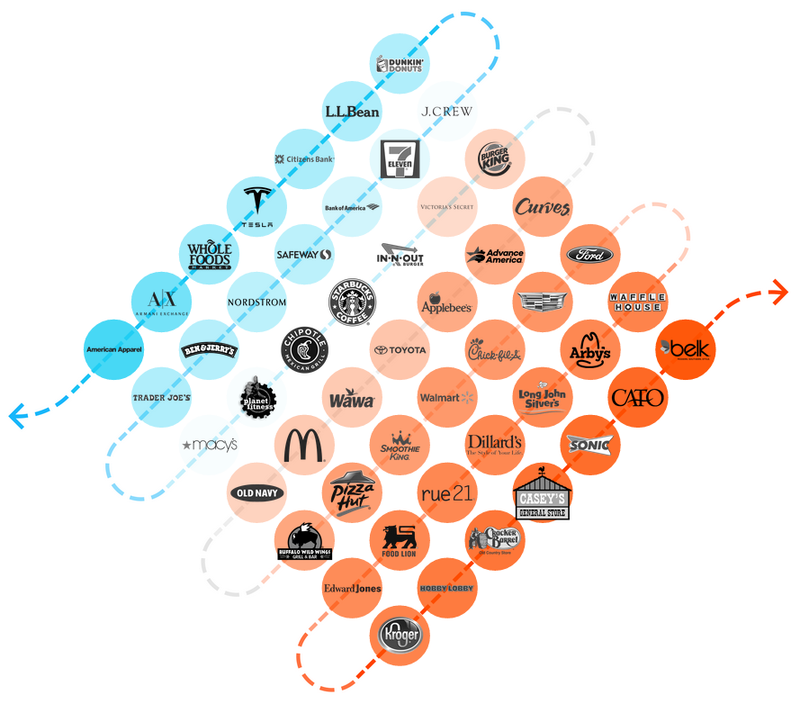 The following chart places 49 common brands on a political spectrum based on the percentage of their brick-and-mortar stores that are located in Democratic or Republican districts. To do this, TIME matched nearly 2 million store locations provided by the research company AggData to their corresponding Congressional district and then tallied them by that district’s vote in 2014 midterms. Of the 139 American Apparel stores, for example, 83 percent are in blue districts. Nearly nine in 10 Belk department stores, meanwhile, can be found in red districts. All the other brands on the chart fall somewhere in between. You can look for any store you like in the search tool below the graphic. There is no evidence, of course, that a regular infusion of banana ice cream and fudge chunks inspires a person toward liberalism. Because two-thirds of the Ben & Jerry’s in the United States are found in Democratic districts, however, the mere presence of a store in a district raises the statistical odds that its residents are people who vote for Democrats. While stores like Whole Foods or Hobby Lobby might already conjure partisan stereotypes, the vast majority of America’s brands do not. Even so, where these stores are located tells us a tremendous amount about who their shoppers are sending to Washington. The list of retail locations was provided by AggData. Stores were matched to Congressional district by comparing their longitude and latitude to the Census definitions of districts. The results do not include the 14 Congressional races that have yet to be resolved as of 6:00 AM on Nov. 6, 2014. Correction: The interactive chart originally linked the incorrect record for Armani Exchange when the user clicked the icon in the chart. It has since been updated.